Modular construction offers a number of benefits to project owners, developers, construction companies and builders. Beyond quality management and improved completion time, controlled manufacturing environments and repeatable designs – like prefabricated, bathroom pods – can help you drastically reduce overall cost, simplify construction and improve safety. Roof truss and wall framing company Austruss in New South Wales uses the FRAMECAD System with LGS modular construction methods to manufacture bathroom pods as a way to increase efficiency and run a more sustainable business. “It’s getting more expensive by the day to undertake projects. If we don’t continue to innovate and do things more efficiently, that’s going to be a problem in the long term. We’re going to use more energy and create more pollution because we’re creating things in a more complex manner,” explains Austruss Managing Director, Andrew Fowler. 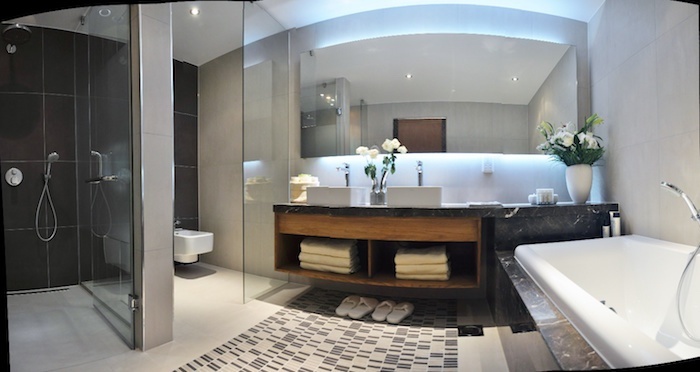 One of the largest and most complex components of multi-unit commercial development projects are the bathrooms. They’re largely repeatable, require multiple skilled trades in a relatively small space and demand a high quality of finish. So the ability to leverage prefabrication for bathroom spaces by developers, builders and project owners is an excellent way to create better efficiency within the overall project. One of the biggest drivers for Austruss to move into modular construction was the control and efficiency that came with this method of construction and the FRAMECAD System. When building within a controlled environment, a project can be done the first time and more importantly, properly the first time. The efficiency and precision of the FRAMECAD System also means that wasteage is reduced and accuracy assured, ensuring a high end finished project. “The quality, the reduction in labour required on site and reduction in materials handling on site -- that’s the efficiency that this kind of operation provides to the building industry. Any business has got to aim to be more streamlined as time goes on, and we’ve got to improve processes to make it better, and that’s part of why we’ve gone into modular building,” says Andrew Fowler. LGS bathrooms can be sized, designed and accessorized precisely according to architectural plans, then built under controlled factory conditions. Pods can be constructed off-site to be completely finished with a clean exterior and ready to use. This means that it will be integrated, with pre-tested plumbing and electrics, as well as being code compliant and ready for final hookup. Modular construction accelerates the construction timeline through controlled manufacturing and efficient on-site installation. Pods can be fabricated in a factory while crews prepare the site, infrastructure, foundations and superstructure. Superior Quality. The efficiency and accuracy of the FRAMECAD System means that bathroom pods are able to adhere to strict manufacturing quality guidelines, meaning each and every pod comes out as per your design specifications. Indoor factory equipment also protect materials and prevent weather delays. With modular construction, there is no need to juggle multiple trades in a limited work space on-site. Pods can be designed for onsite compatibility and delivered, installed and connected to the building’s mechanical systems. Fewer employees at the work site can reduce incidents, violations, and potentially your general liability insurance. To find out more about how FRAMECAD helped Austruss click here or to discover more about how FRAMECAD can benefit your manufacturing operation, get in touch today.